Your plot deck must be 12 cards, including exactly 5 different Scheme cards. During the plot phase, Scheme cards are not considered to be in your plot deck. Reaction: After you win an challenge by 5 or more STR, kneel your faction card to reveal a Scheme plot. If that card leaves play, remove it from the game. Card Design by 2013 Joust World Champion, Álvaro Rodriguez. Lions of Casterly Rock #45. Your plot deck must contain exactly 5 Scheme plots and 7 non-Scheme plots. You cannot reveal Scheme plots normally during the plot phase. When you reveal your last non-Scheme plot and resolve all When Revealed abilities, return your used plots to your plot deck. After you win an intrigue challenge by 5+ STR, you may reveal a Scheme plot and initiate it's When Revealed ability (your currently revealed plot goes into your used pile). When you reveal a new non-Scheme plot during the next turn's plot phase, your currently revealed Scheme plot is removed from the game (instead of going into your used pile). If you reveal Sneak Attack, and you've already initiated a challenge this turn, then you cannot initiate any more challenges. I just wanted to check on the interaction of Power Behind The Throne in the 'Rains' plot deck. When the Stand token is placed on Power Behind the Throne, can it remain on there, into the following round/s, until a new 'Rains' plot is revealed and placed on top of it? or does the normal plot sit on top of it, and therefore cancel it out, in the new Plot phase? Rules FAQ: Interaction with claim raising/lowering effects. EDIT: Nate overturned what I wrote here. Designed and built by Alsciende. Cards data maintained with great dedication by the TheIronThrone.net team. Please post bug reports and feature requests on GitHub. You may contribute by giving money on Paypal. 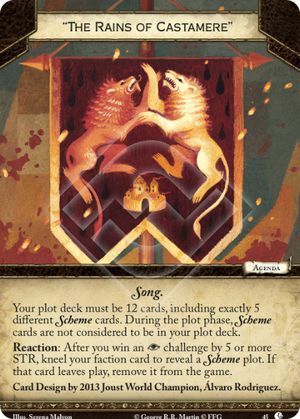 The information presented on this site about A Game of Thrones: The Card Game Second Edition, both literal and graphical, is copyrighted by Fantasy Flight Games. This website is not produced, endorsed, supported, or affiliated with Fantasy Flight Games.